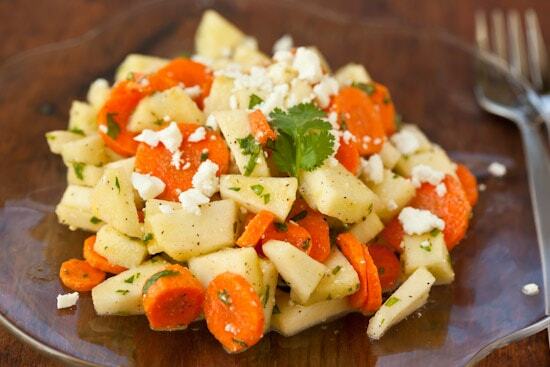 I made this delicious apple carrot salad with cilantro and feta for lunch today and although I’ve never combined these exact flavors before, I’m really happy that I gave it a try. The sweetness of the apples and carrots is cut by a tart lemon vinaigrette and the cilantro and feta turn an ordinary side dish into something really special. We have a dry erase board on the side of our refrigerator where I try to keep an updated list of what’s inside. It was Phil’s idea and I actually resisted doing it for a while because I didn’t think we would keep up with it. It turns out that I absolutely love it. It’s a lot easier to glance at the board and figure out what could turn into a meal than it is to bend down and dig around our dimly lit, poorly organized refrigerator to see what’s hiding inside. Our refrigerator ingredient list is not really organized, but that’s what makes it fun. Sometimes just seeing random things written down next to each other triggers a recipe idea that I might not have thought of on my own. This salad is one of those recipes. I happened to notice apples and cilantro on the list next to each other the other day and the combination sounded really interesting to me. I wrote the words “Apple Cilantro Salad” on the bottom of the board. I’ve been thinking about it since then and today I finally had time to play around with the idea. I made this salad just for me today so I’m giving you a recipe that serves only one person for lunch or two people as a side dish. Since it’s slightly unusual, you might want to try this small version before doubling or tripling it for a crowd just to make sure you like the flavor combination as much as I did. I loved this salad as is, but if I had any on hand I might have tossed in some pomegranate arils and/or toasted chopped walnuts. I always like things on the tart side so I used granny smith apples and a pretty tart dressing. You can sweeten things up a bit by using sweeter apples and/or adding more honey to the dressing if that’s your preference. As always, taste as you go and adjust things to your liking. *Use whatever type of apple you enjoy eating. If the apple is especially tart, you might want to add a bit more honey to the dressing—taste and adjust as you go. I have pears. Think that would work? I like the sound of this salad, though I might substitute mint for the cilantro (I'm one of those people...). The white board idea is very cool, especially in the way that it can inspire new combination ideas. I've been thinking of doing that for the chest freezer, just to help us remember what we have in there. Seems like once something goes in, we forget all about it. Ruby - I think pears would be good! I think I need that list idea. Seriously. But as soon as I make any kind of list for any reason (except a grocery list and that's because I'll forget what I need...) I seem to ignore it. The salad sounds delish! Absolutely lovely and easy recipe. Just had it for lunch! Yum! This reminds me of a post I found once while trying to figure out a better way to organize my freezer. (And a way to use up all this chalkboard paint that I have left over from a project!) Sometime this December, I plan on roughing up one side of the fridge and making it into a chalk board instead. This is a GREAT little salad idea. I usually eat a paleo-style diet (but I'll look the other way while I eat the feta cheese! ), and this is such a great way to add some variety to the basic ingredients that I seem to eat all the time :)Yum! !The dry erase board is a good idea too. I might try something like... my fridge is also dimly lit and poorly organized. Just made it. Very good andI suggest you double it.